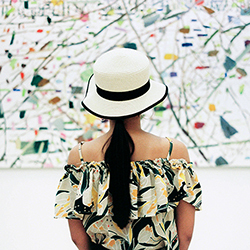 Enjoy Outside the Lines, the 69th annual juried art show from Seattle Co~Arts. Artists often learn to stay within the lines, following specific techniques that lend order and impact to their work. Beautiful and imaginative creations often develop within the lines. But what happens when creators expand beyond those boundaries? Seattle Co~Arts explores this idea in Outside the Lines, the group’s 69th annual juried show. Discover how more than 30 artists approached their arts practice from new perspectives to create 60 original paintings. 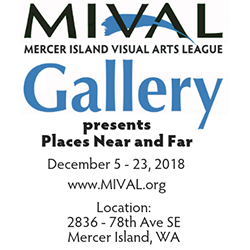 The Mercer Island Gallery is one of two galleries programmed by the Mercer Island Arts Council in partnership with Mercer Island Parks & Recreation. Located at the Mercer Island Community & Event Center, this indoor space is open to the public and mounts new exhibits approximately every six weeks. Works of art are also for sale, with a portion of sales supporting Arts Council programs. © Copyright 2018 - Mercer Island Center for the Arts. Mercer Island Center for the Arts is a registered 501(c)(3) organization. Donations are tax-deductible to the full extent allowed by law. Federal Tax ID# 46-4319988.